Purchase e-Book This national award winning book was developed especially for Extension Master Gardener℠ Volunteers and home gardeners and is a primary source for research-based information on gardening and landscaping successfully in the southeast. 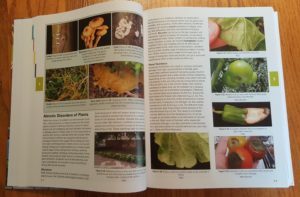 The Extension Gardener handbook is a fundamental reference for any seasoned gardener, but it is written so clearly, it also appeals to beginners just getting their hands dirty. It explains the “why and how” basics for every gardening subject from soils and composting to vegetable gardening and wildlife management. Advice on garden design, preparation, and maintenance covers all types of plantings including lawns, ornamentals, fruits, trees, and containers. Image of sample pages from the hardback copy of the Disease chapter illustrate one of many layouts of text and images. 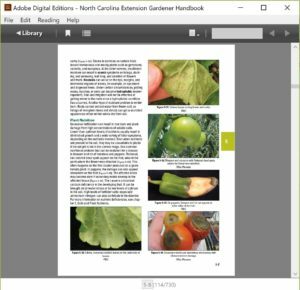 This 728 page handbook also provides practical tools like 1,067 color images, detailed graphics, 109 tables including 5 diagnostic tables, case studies, frequently asked questions, and specific management strategies for insects, diseases, weeds, and other pests. Written by a team of the state’s leading horticulture experts, it contains a wealth of information to support you in creating and managing thriving gardens, lawns and landscapes. 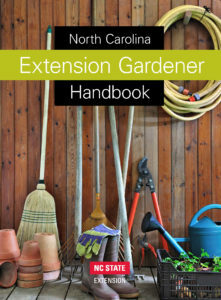 This is an essential book for serious gardeners in North Carolina and the southeast. The same content in digital document format. It is available for sale as an 8.5 X 11″ hardback book and as a digital document formatted to match the print version. When you purchase the digital document you can upload it on up to 6 machines (desktop computers, laptop computers, tablets and phones) but it can not be copied and shared, or printed. Order a hardback copy or a digital copy go.ncsu.edu/order-eg-handbook or call 800-848-6224. The same content viewed in the open access format. 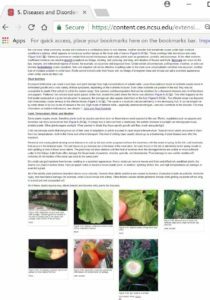 Visit our portal, gardening.ces.ncsu.edu, a gateway to online resources from NC State Extension. Contact your County Extension Center, www.ces.ncsu.edu/directory/ , to speak with local experts. Become an Extension Master Gardener℠ Volunteer and join an outstanding group of lifelong learners working together to change the world.